Just as you can use the iPhone as a Wi-Fi hotspot, many Android smartphones and tablets offer similar features. With a Wi-Fi hotspot, you can share your mobile data connection on your Android device wirelessly with up to five other devices, including other cell phones, tablets, and computers. The Wi-Fi data-sharing feature is built into most Android devices. Hotspots offer more convenient capability than tethering, where you would share a data connection with a single computer using a USB cable or Bluetooth—possibly with the help of software like PdaNet. Be selective when you use your smartphone as a Wi-Fi hotspot, and with whom you share the password because every bit of data processed through this Wi-Fi feature eats into your monthly allotment of mobile data usage. The directions below focus on "stock" Android on a Google Pixel and a Samsung Galaxy S9. Other devices' interfaces and processes may differ depending on who made them: LG, HTC, Huawei, Xiaomi, etc. Go to Settings on your Samsung phone. You can get there by pressing the menu button on your device when you're on the home screen, then tapping Settings. At the Settings screen, tap the Wireless & networks option. On a Samsung phone, use the Connections menu; then tap the Mobile Hotspot and Tethering button. To adjust and check the settings for the hotspot, tap the Mobile Hotspot option again. You'll need to do this if you don't know the default password that will be created for your hotspot so that you can make a note of it for connecting your other devices. You can change the default password, security level, router name (SSID), and also manage users connected wirelessly to your phone in the Wi-Fi hotspot settings. You should now be able to use the hotspot with your various devices. Launch the Settings app, then tap Network & Internet. Tap Hotspot & tethering, then Wi-Fi hotspot. Toggle the switch at the top to ON. You can also change the hotspot name, password, and other advanced settings like automatic shutoff and the AP Band on this screen. From each of the other devices with which you want to share Internet access, find the Wi-Fi hotspot. Your computer, tablet, or other smartphones most likely will notify you that new wireless networks are available. If not, on another Android phone, you'll find the wireless networks under Settings > Wireless & networks > Wi-Fi settings. See general Wi-Fi connection instructions for most computers. Finally, establish the connection by entering the password you noted above. 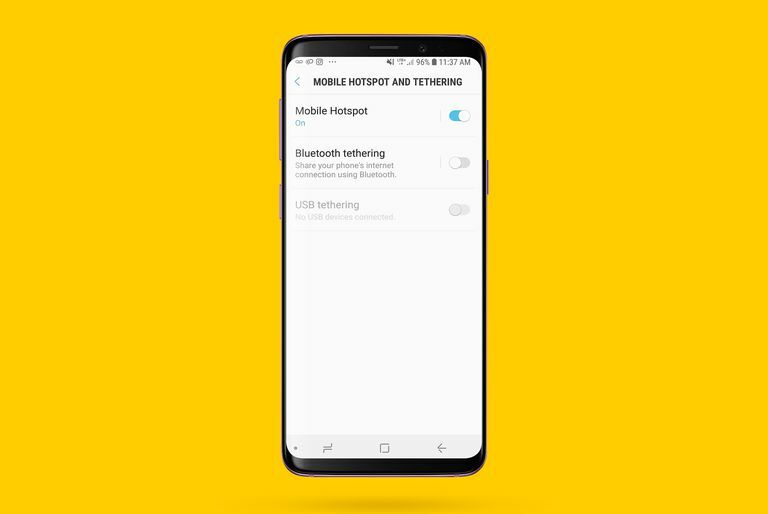 The default procedure for the universal Wi-Fi hotspot feature found in Android works if you have a device that supports hotspotting and a data plan to pair with it, but even if you follow the procedure you might not get internet access on your laptop or tablet after you connect. The reason is that some wireless carriers restrict the Wi-Fi Hotspot access only to those who are paying extra every month for the feature. Try using an Android widget app, such as Elixir 2, that toggles the Wi-Fi hotspot on or off on your home screen so that you can access the hotspot feature directly and without piling up extra charges from your wireless provider. If that widget doesn't work for you, a free app called FoxFi does the same thing. Although these apps circumvent carrier restrictions, in most cases bypassing carrier limitations constitutes a terms-of-service violation in your contract. Use these apps at your discretion. Turn off the Wi-Fi hotspot feature when you no longer need shared Internet access for other devices, because leaving the feature activated will drain your cell phone's battery significantly. By default, the portable Wi-Fi hotspot will most likely be set up with WPA2 security and a generic password. If you are using this feature in a public place or are concerned about hackers trying to intercept your data, it's best to change the password to something else before broadcasting your signal. Different devices and carriers offer slightly different combinations of steps to activate the mobile hotspot feature. Some carriers even require that you use a stand-alone app, instead of the stock Android capability, to share your data plan with Wi-Fi users. You may need to check the specific instructions for your device manufacturer or your service provider for more precise instructions.